PyeonChang 2018 Discounts Apply ! 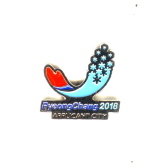 2018 PyeonChang, raised enamel logo, silver, tack back. Looking for a great gift idea for that special friend or relative. Click above to send them a certificate to this website. Minimum amount is $10.00.